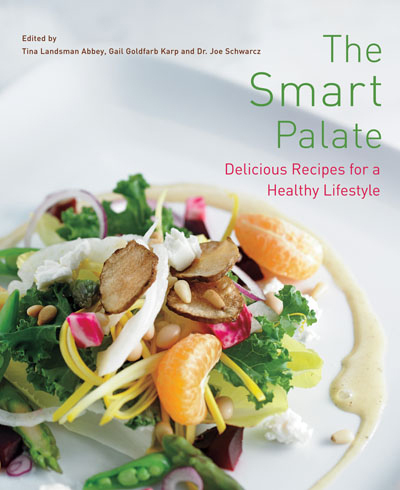 Members of the public are invited to celebrate the launch of The Smart Palate cookbook on Monday, Sept. 15, from 5:30 p.m.-7:30 p.m., at Phamascience, Inc. (6111 Royalmount Ave., west of Decarie Blvd.). Free parking will be available.. Featuring more than 180 tasty and nutritious recipes, along with chef’s tips and smart food facts, this beautifully illustrated cookbook was written for people who are health conscious and passionate about food. The cookbook costs $40 (plus tax) and all proceeds from sales will support groundbreaking cancer research being conducted at McGill University’s Rosalind and Morris Goodman Cancer Research Centre. People will be able to sample some of the recipes at the launch. For more details and to RSVP (before Sept. 5), go here. If you cannot attend the event and would like to purchase a cookbook, please contact Annette Novak at (514) 398-4970 or by email.